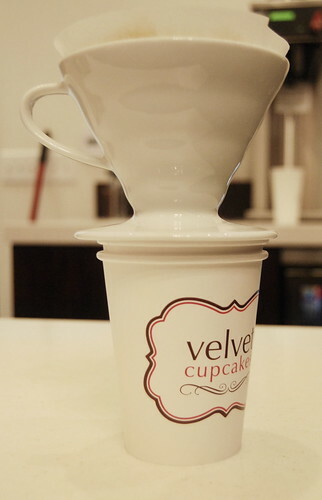 Yesterday after work I was catching up on my Twitter stream when I saw that Velvet Cupcakes at the mall (which I first blogged last November) announced they were now serving pour over cups of Intelligentsia coffee. As of right now, Undergrounds is the only other place doing so in SCV, so of course I was excited. 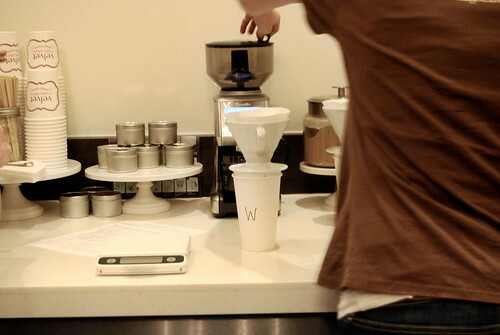 By now you are all fully aware of our coffee snobbery, and how the SCV Crew makes frequent trips to Intelli just to get our fix, and other third wave shops throughout LA. So hearing that I could get some orange bag Intelli goodness so close to home, and at a cupcake shop totally made my day. 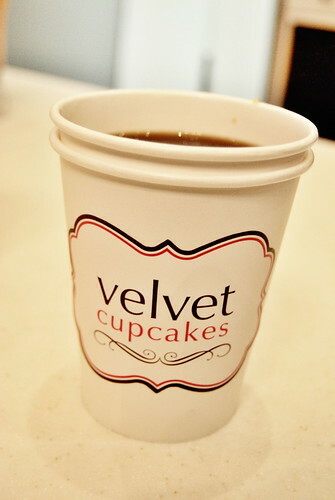 Before trivia, N8 and I met up for dinner and stopped by Velvet Cupcakes for some coffee. 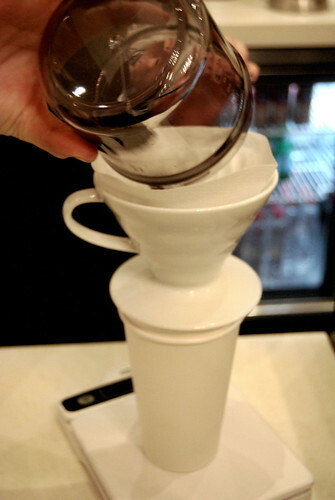 The girls working were really nice to us, and talked us through the pour over method. Although we are super familiar with this (coffee snobs remember) it was nice to see these girls so excited to prepare our cups of coffee! 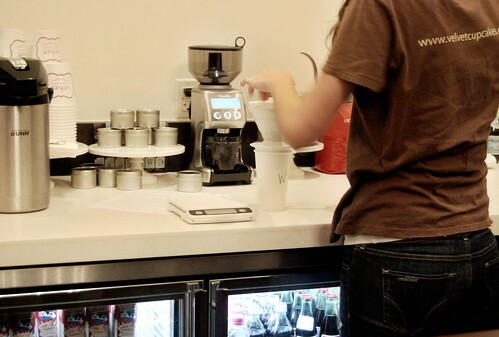 Each cup of coffee you order starts with freshly ground beans and ends up as a fresh cup. Sure it may take a little longer, but it is so worth it! And…as if that wasn’t enough…as we were drinking our coffee, we were told that starting Friday they would be selling Banana Pudding. So, SCV…have I let you down yet? Trust me on this one! 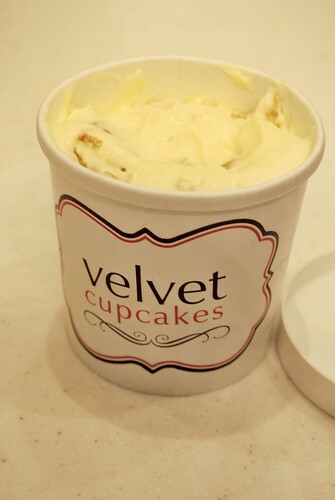 Head over to Velvet Cupcakes for a cup of coffee and some banana pudding. You can thank me later! 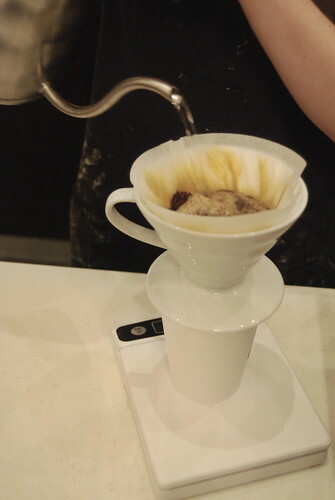 And, if you have heard us tweet and blog and talk about our love of coffee and have wondered what all the Intelli fuss is about? Now you can check it out for yourself! 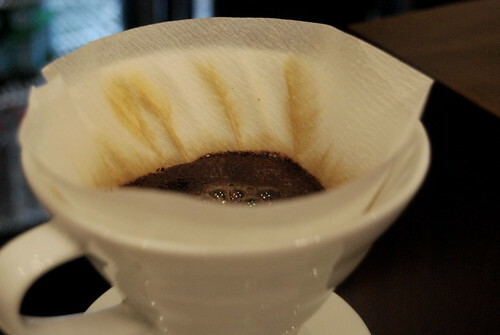 Do @mic_dee a favor though, try it without the cream and sugar? Just once! Oh, and of course! 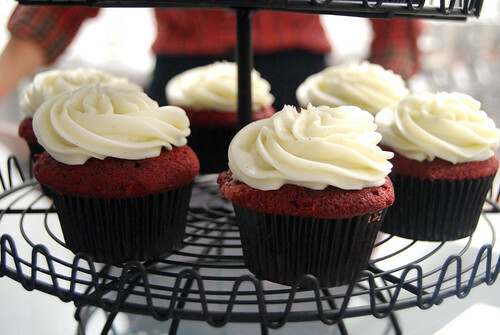 You can’t forget the cupcakes! 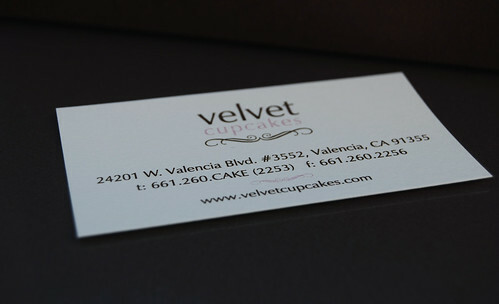 Awesometown (Valencia) has its very first legit cupcakery! It has been a long time coming, but yesterday an actual storefront shop finally opened up and they were selling out faster than they could make them. 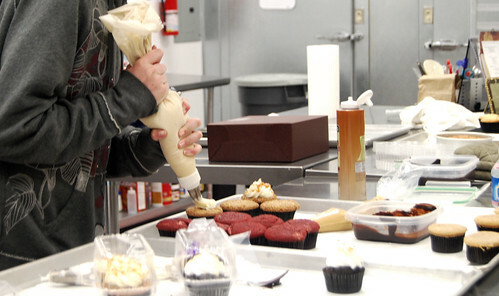 The shop was crowded and it smelled like cupcakes! Very neat. Not only did it smell good, but the place is adorable! 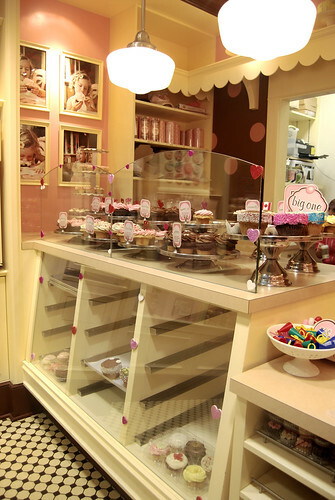 It reminded me very much of the Sprinkle’s layout, with seating at the window so you can people watch. Additionally? 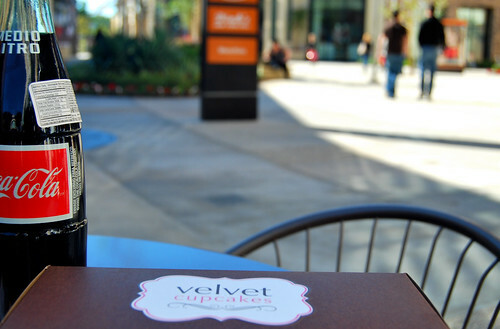 It is located right across the way from Sephora and other shops in the new section of the Paseos. 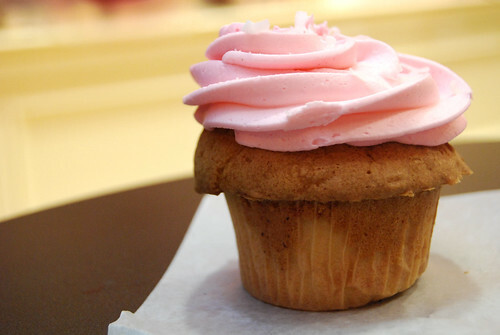 Yesterday I had a strawberry cupcake, since they were sold out of most flavors. Today I went back to Sephora (heaven) and decided to stop by and try two more flavors. This time around I had the Peanut Butter Chocolate. Chocolate cake and peanut butter acting as the frosting. 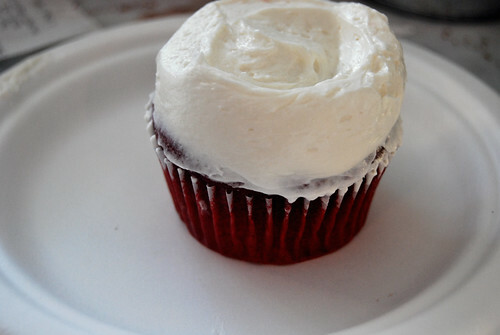 And of course, my go to flavor at ANY bakeshop…the always classic Red Velvet. This one had a tiny heart in the center. Very cute. 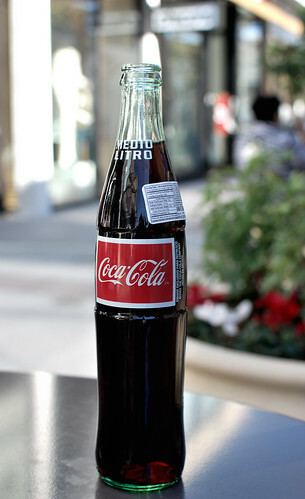 They also carry their own bottled water, Groundworks coffee, sodas, and the always classic Mexican Coke. Medio Litro. Can’t think of a better pairing with cupcakes. I think this is the best thing to open up in Valencia in a long time. Sure there are two other storefronts in Canyon Country and Saugus, but this one PWNS them all by far. By a mile. By acres. 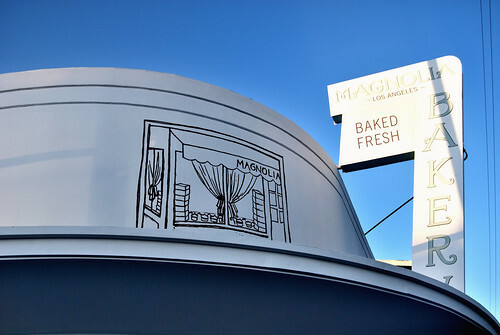 Since it is a storefront, I could easily stop by after work for a sweet treat. It is also a great place to meet up with friends. We ended up sitting outside for a bit, under the sun, chatting, and people watching. All around us, there were people sitting at the tables, including kids, just eating cupcakes. It was a really nice, casual, low key, scene at the Patios today. Not a bad way to spend a day off work. I still love Bake You Happy, but this is a nice place to hang out and a welcome addition to the SCV! 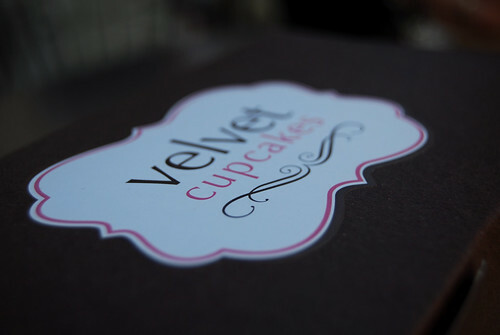 Velvet Cupcake is BY FAR the BEST cupcake shop (STOREFRONT) out of the three we have in town. I’m sure that anyone that goes there will enjoy the ambience. It seems like only yesterday I randomly stumbled upon Bake You Happy. 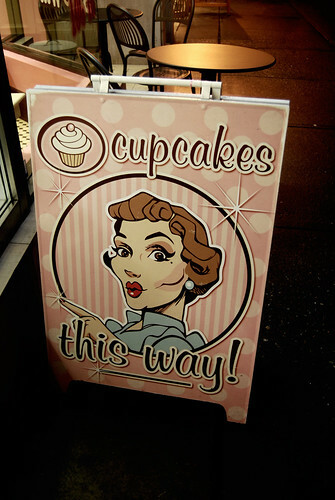 It was a great find, unexpected, local, cupcake perfection. 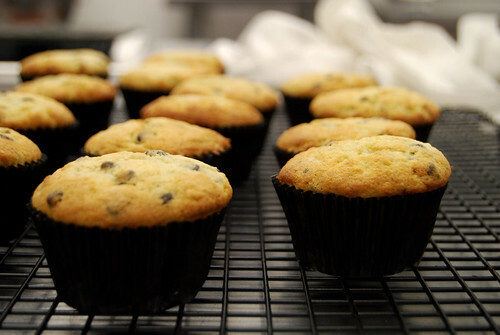 For the longest time, Bake You Happy lacked a storefront and they were available in limited qualities at Its A Grind if you got there early enough. Of course my friends and I often placed orders, but it wasn’t like we could just have one anytime we wanted. Back in July, some of us were getting the Bake You Happy craving so we got together and had a second tasting, which of course, was perfection. Still…these cupcakes are so epic that it was a bit frustrating to think that we couldn’t just go somewhere whenever we got the craving and buy one. Which brings me to last week…my brother Hsiawen said he saw an ad for Bake You Happy in a local magazine and informed me that they had a new kitchen. Whut!?!? I called Kim and asked where they were located and if we could stop by and buy single cupcakes. It turns out they have been at their new kitchen for only a few weeks and she invited us to stop by and check it out. It isn’t a storefront, but you could certainly call ahead and see what they have available that day. Or simply call her for pick up. No, really. Do it. You wont regret it. So last night my friends and I gathered at their new kitchen space, located on Industry Drive in Castaic/Valencia. You can ask Zigler to clarify which city it is in. All I know is that it is very close to home. Success. Here are some just out of the oven! 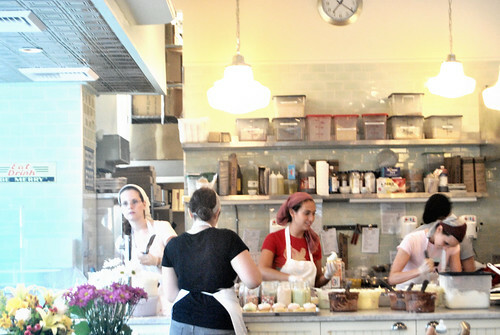 They share the kitchen with Victoria Duvall of Cookie Couture (she was on the O List) and it is very clean and crisp! Soon almost 20 of us had gathered to visit with Kim, check out the new space, and eat cupcakes. 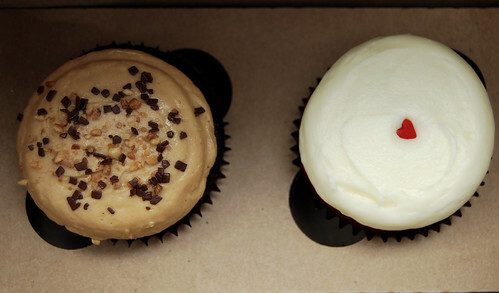 Kim had a great variety of cupcakes available, but I went straight for the Peanut Butter. It was amazing. 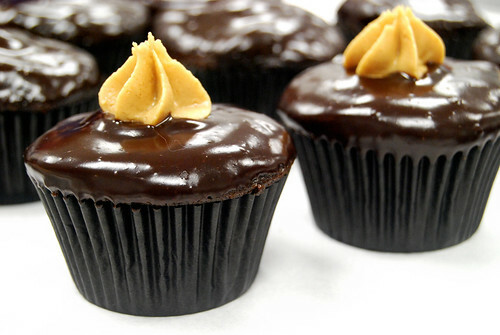 Moist chocolate filled with peanut butter. My new favorite Bake You Happy offering for sure. 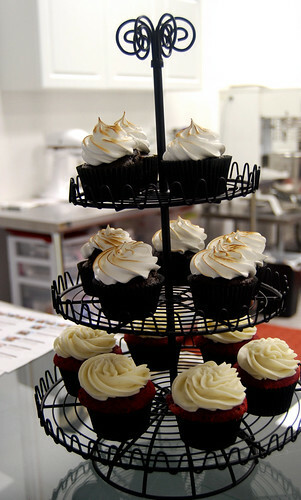 Well…maybe it is actually tied with the Smore Cupcake…guess what? It has a graham cracker crust. 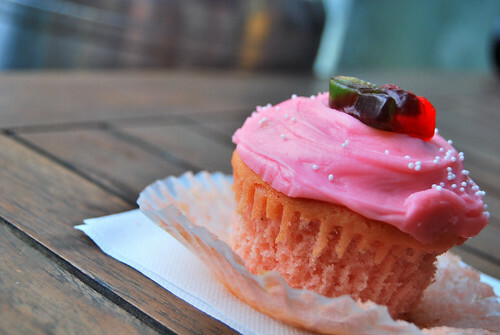 A cupcake with a graham cracker crust! It is AMAZING x 100. Seriously. 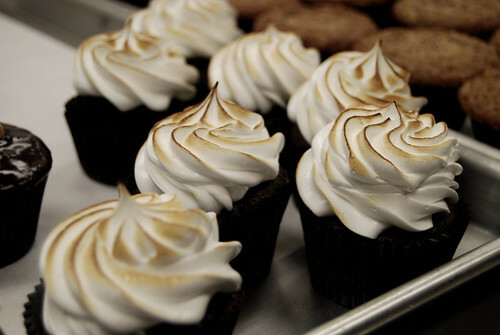 I didn’t know a smore cupcake could be this good. 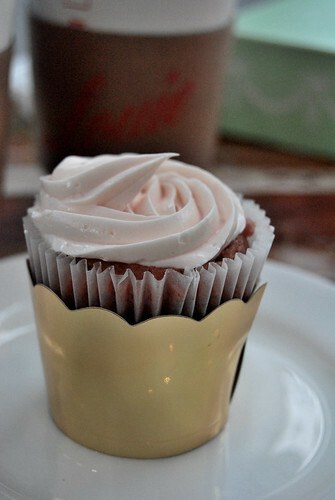 Nothing frilly, just a dainty cupcake consisting of quality ingredients and moist chocolate. As the crowd started to thin out, Kim let some of us try our hand at decorating cupcakes! Here is Deb doing a great job as Kim looks on. Here is 13 year old Katie who proved to be a natural! And here is Kyle Jon! 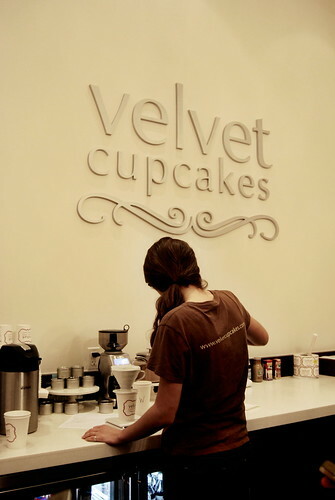 If you follow my blog then you know that I’m always trying cupcakes anywhere and everywhere, so believe me, this place is really special. Bake You Happy definitely slangs some of my favorite cupcakes. They have new individual boxes available so I think I’m definitely going to do that for co-worker gifts this year. Plus! Kim delivers within the SCV! 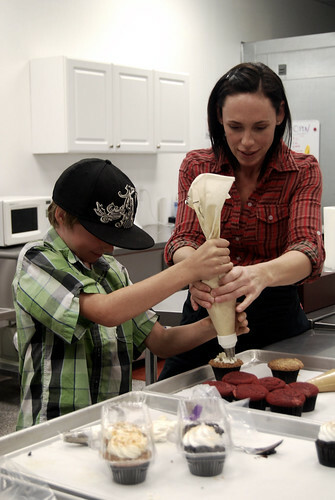 I’m so happy to see this bakery growing and I know big things are happening for Kim Thurman and Kim Aeck! If you have a craving, feel free to give them a call for pick up. Even if you only want one or two, I’m sure they’ll make it happen. I love these cupcakes so much and I know my friends are all believers now too! Oh and they are on Twitter too! Yesterday, on Twitter I heard that today was the day! Even though we had the SCV Coffee Caravan planned, we figured we could stop by after it was over. So that is what we did around 7:30ish. I thought surely it would be closed by then, but it wasn’t! Turns out some days they will close as late as 10pm. Total score! The SCV Coffee Caravan left me a bit jittery and it made me sad to know that my first visit to Magnolia would be while I was feeling sickly. However, you know me. I like to visit places on the first day open, amiright? So off we went. I am not oblivious to the Magnolia haters out there, but this is MY opinion, and remember this is something I had been looking forward to for a while. Walking inside was like a fairtytale dreamland. 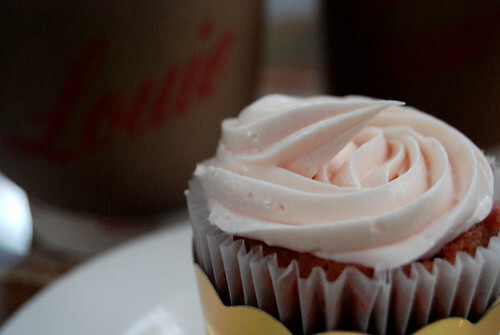 The cupcakes were being frosted right in front of me and it was like out of a storybook. The decor and the charm of the place was unlike anything I had experienced in Los Angeles. Everyone working was kind and polite, and all the cupcakes and pastries looked amazing. 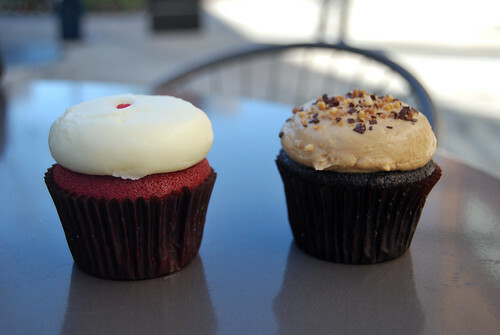 I ended up ordering two cupcakes. 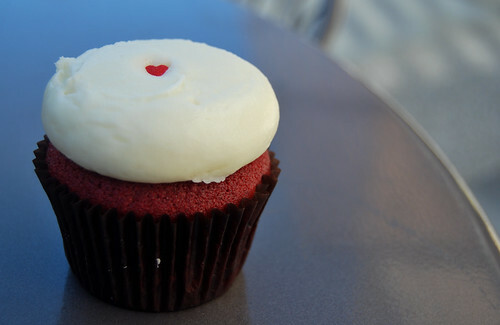 The classic red velvet, of course! The frosting was much lighter than what I’m used to, but it went perfectly with the cake part. It took a few bites to really get into it, but yes. I’m a fan. It is much more subtle flavors than Sprinkles. I also got a plain vanilla. Nothing spectacular, but still good. If the cupcakes look a little smashed, that was my doing. 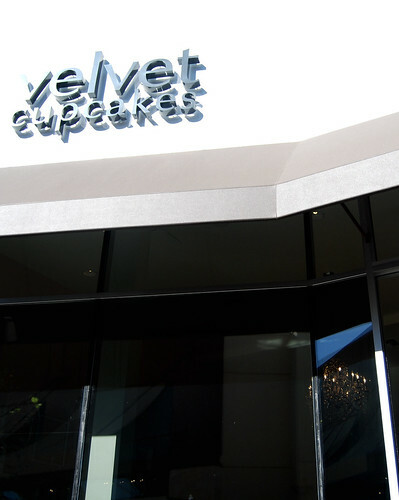 There is currently no seating inside (or outside) but I would imagine they would add some sort of table/chair situtation…You can also choose to get your cupcakes packed in a box to go. Last Saturday, our SCV crew had a Bottega Louie fail that was so massive, Nate immediately declared war. Well, I have been to Bottega Louie 234242 times and have experienced my fair share of service fails, yet I keep going back. And, this is why. Their pastries are incredible! As I mentioned in this post, if you are ever running late and need a gift? 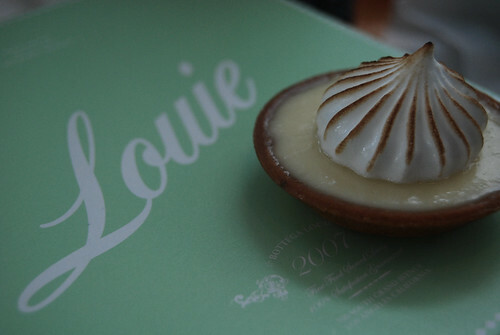 Stop by Bottega Louie for a fruit tart or a box of macaroons. They will box them up for you and even add ribbon. Seriously. Sidenote? Last year, I used pink Bottega Louie ribbon to pull down the projector screen in my classroom. Trufax. Have I told you how much I love the pastries here? 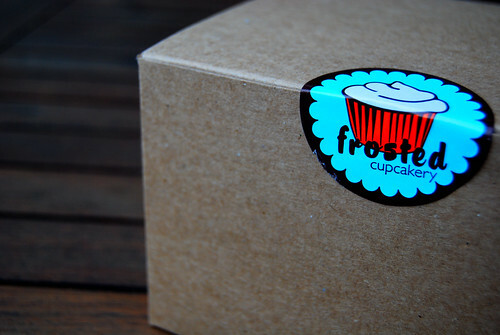 Well on this particular Sunday, I ordered my usual cupcake. You may remember last year we had a cupcake tasting at work. Check it out here. This time around I noticed a flavor I had never tried before. I figured it was strawberry, so imagine my surprise when I was told it was a raspberry cupcake. Yes please! It was amazing. Just amazing! Loved it so much! I don’t think they have this flavor all the time, so I was just there at the right time. I’ve tried about four different flavors and all of them are good too! 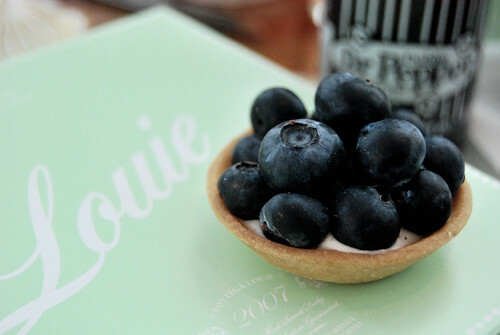 This particular day I also had two mini fruit tarts which were CRAZY GOOD! They also have OG Dr. Pepper! Total score! I have had plenty of FAIL service at this place, but if you just want to stop in for dessert you can just grab a seat in the cafe area and enjoy! Seriously! One day I hope Nate will give BL another try, because if I keep coming back despite the service issues, it must be for a reason, amiright? On the way back to our hotel, the third night in Vancouver for the Olympics, a cute little pink shop caught my eye. One that was slanging cupcakes on the rainy streets of Canada. Awesome. This sign at the door totally lured me in! Excellent marketing tool! 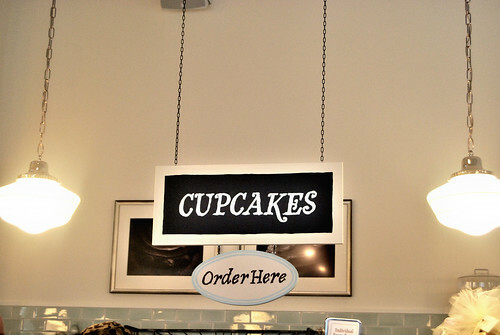 I guess this shop is simply called Cupcakes and even though it was late at night, it still smelled like cupcakes. They had a lot of varieties of cupakes laid out, and oddly enough, I wasn’t that hungry for something sweet so it was hard to pick just one. 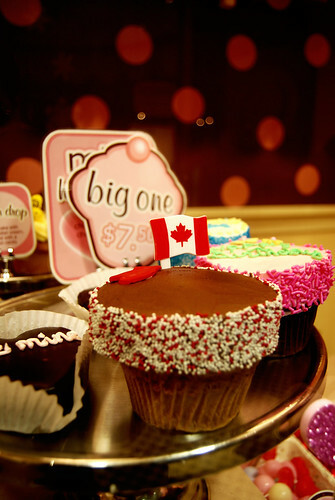 At first I was tempted by the idea of one of these giant cupcakes! Especially the one with the Canadian flag! However, due to fact that it was chocolate (I’m allergic) and that it cost $7.50 made me change my mind. I mean, it was bigger than a normal cupcake, but my limit on cupcake spending is more in the $4 range and that’s considered a splurge. 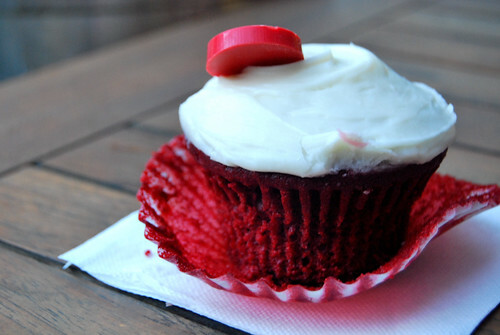 Usually I would just go with a red velvet, but something else caught my eye. The thing is, I don’t remember what flavor it was exactly, but it was something exotic. It was coconut and strawberry and something else. 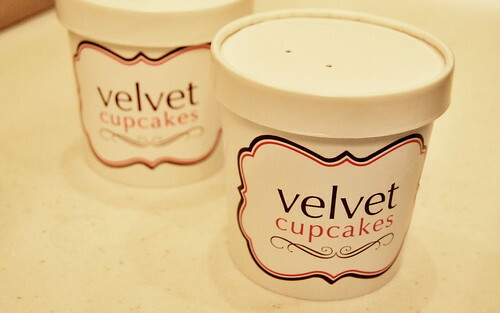 I’ve never had a non-traditional flavored cupcake that good before. It was out of this world amazing. I’ll try to figure out what it was and I’ll come back to edit. 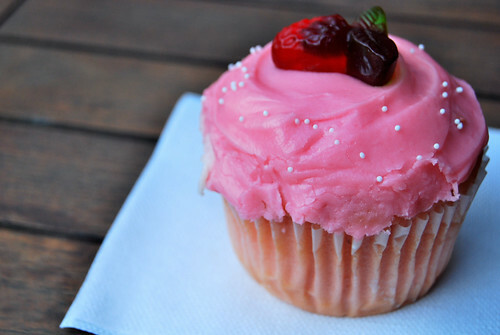 The picture makes it look like a plain vanilla and strawberry cupcake but I can assure you that wasn’t the case. Trust. This was cupcake perfection! 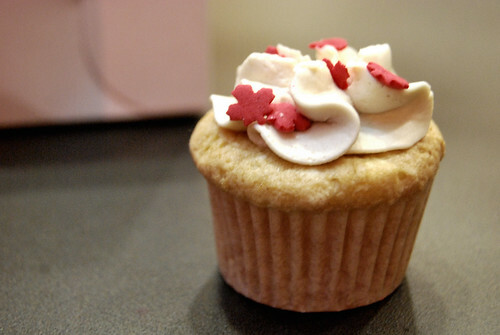 Then I tried a mini just because of the little red maple leaves. So cute and so good! I wrote this review based on my own opiions without looking it up online first. However when I went to look for the address, I came across some mediocre reviews. Three star status! Sadness! I will say that what I had that night was all great! I loved this shop and will probably visit it next time I’m in Vancouver! Late last year I remember passing by this place on the way to Mozza. 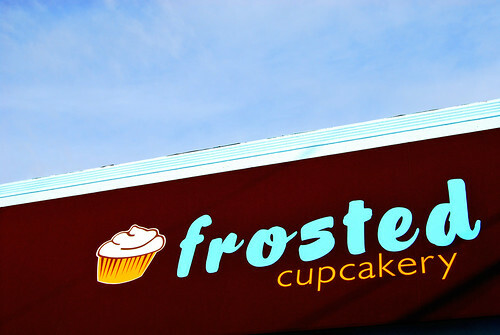 It was a simple shop with its very own parking lot and a very simple sign that said Frosted Cupcakery. At the time it didn’t seem open, so I thought either it had once been there, or had yet to open. 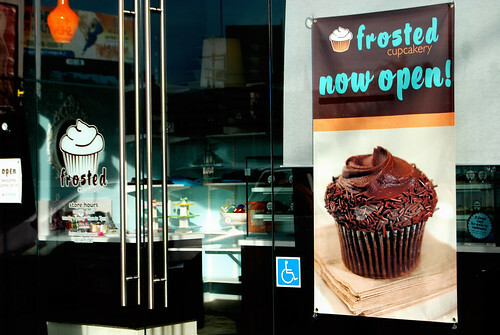 So, imagine my surprise when I happened to pass by last Sunday and saw that Frosted Cupcakery was actually open! This was not my destination, but hey! When in Rome Hollywood! I had no idea what to expect, but as soon as I walked in, it was obvious that this place was brand new. 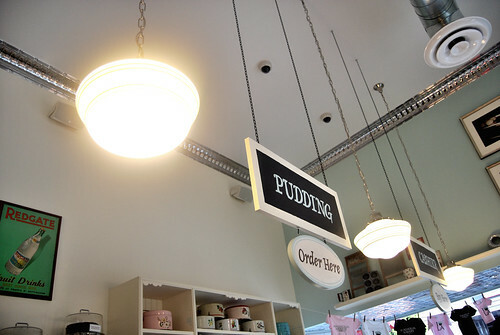 It didn’t have any seating and the lighting wasn’t as bright as most cupcake shops. 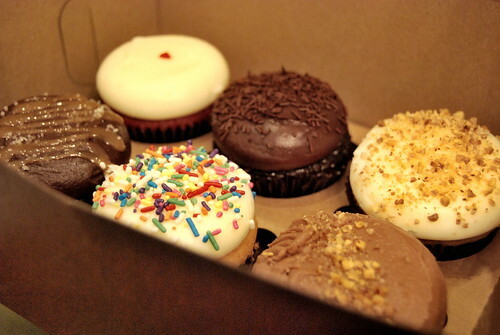 They had a couple of different cupcakes to choose from and I opted for 4 of them without knowing how much they were. Hey! They looked really good! Don’t judge. Anyway, it totally bothered me that they didn’t have any seating. It bothered me a lot. However, I am assuming that they will add tables eventually. Really. 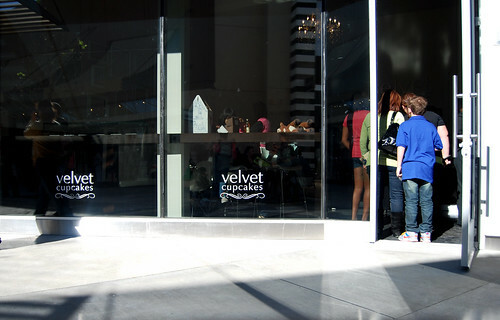 A cupcakery without at least a couple of tables? I’ll take a bench, stool, beanbag? Something! Seriously though, I’m sure it is only a matter of time before some seating comes in. So basically, I had these awesome looking cupcakes that I wanted to eat and photograph, but the hood of the car wasn’t going to cut it and neither was the sidewalk. So we drove around, finally settling for Zen Zoo where we could also get something to drink. Thank you Zen Zoo for allowing me to loiter for a bit. 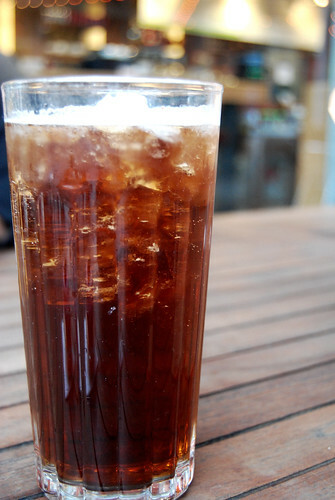 My iced tea was pretty fabulous, by the way! The cupcakes were excellent. All of them. Frosting and cake. Garnish. The first thing I noticed was that three of the four cupcakes each had their own “garnish” on top. 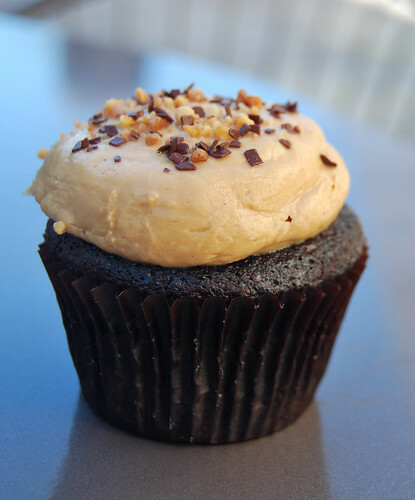 A unique topping that totally went above and beyond the typical cupcake. And it wasn’t anything overpowering either. 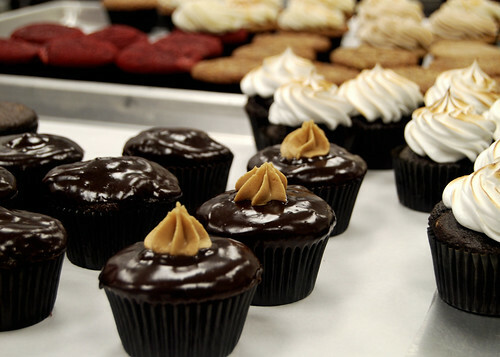 It was just a simple touch to enforce that these cupcakes were made with love. 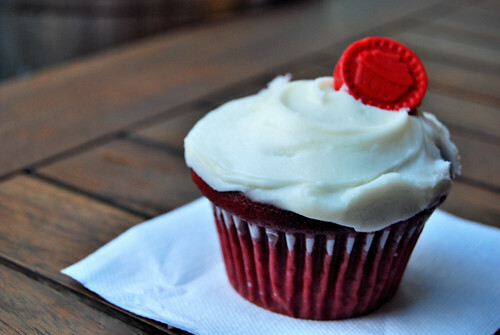 The red velvet had a little candy on top. Super cute! 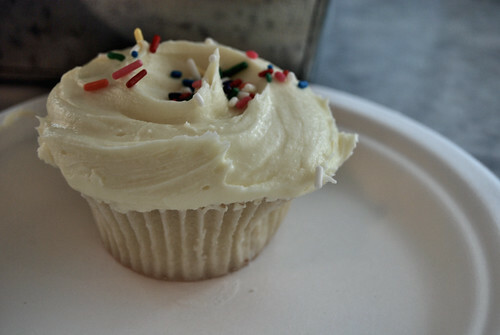 And the cupcake itself was really good. I wouldn’t say OMGZ best ever, but it was definitely in the top 5. THIS was my favorite out of all the cupakes I tried. STRAWBERRY GOODNESS! From the frosting to the actual cake itself. LOVED. The topping on this one was a little jelly candy. The bread and the frosting were both lemon flavored, complete with a little lemon slice candy on top. The fact that it was a bit wonky made it taste even better. Lulz! 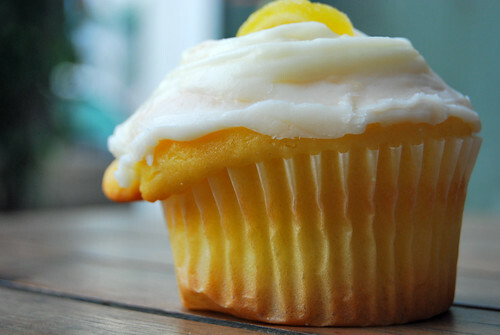 Seriously though, this lemon cupcake PWNS any other lemon cupcake I’ve ever had. It’s not a life changer though. After three cupcakes and an impending dinner at the Lazy Ox Canteen later that night, we decided to save the coconut one for later, so I didn’t take a second photo of it, but you can see it in the box. 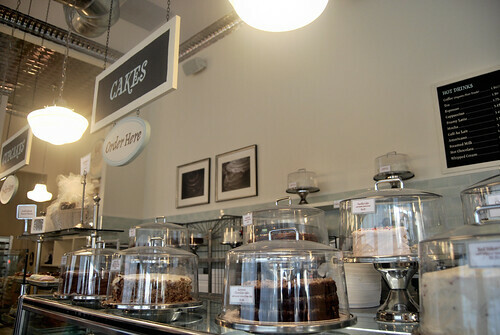 I liked Frosted Cupcakery a lot. I also like that they have a bunch of OG sodas for sale! Would I go back? Oh, yeah most definitely, if I was in the neighborhood. 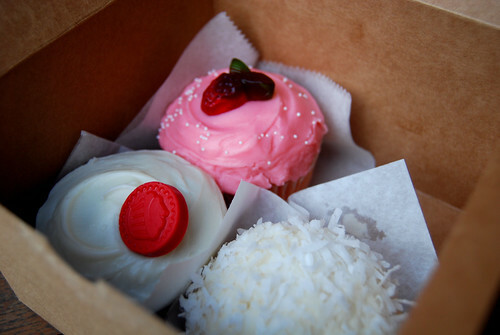 The strawberry and lemon cupcakes are still haunting me! I want! Oh, and apprently this is their second location. The first shop is located in Belmont Shores! A quick little sidenote? They had some really cool bumper stickers, one of which is now proudly displayed in my classroom! Holla!